Sometimes I wake up and think to myself, "What would Edmundo Mell do?" 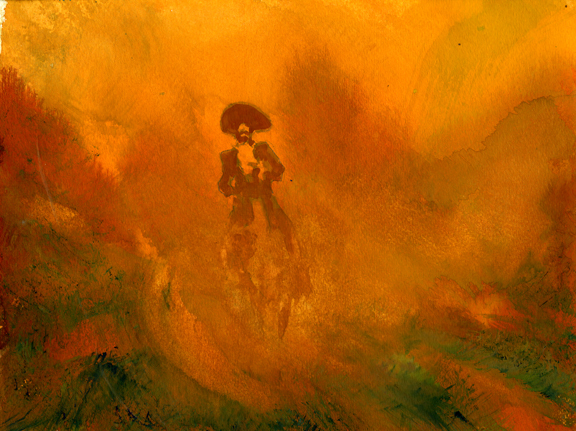 Daily Whip Out: "Vaquero Mell-o"
Other times I think to myself, what would the Duke of Dust do? But Still He Rode On"
When I'm not thinking up weird challenges to myself, I am often looking through one of the 10,000 books I own, looking for inspiration, and, sometimes when I see a picture like this one, below, I think to myself, "Wow. 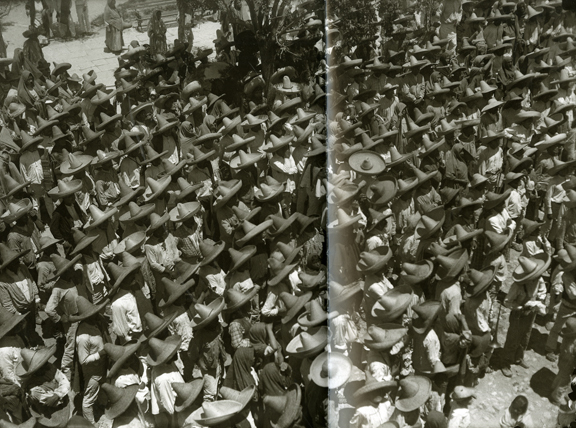 Now THAT'S a forrest of sombreros!" A political meeting, circa 1916, where the Zapatistas and Constitutionalists fought it out rhetorically in gatherings like this before they resorted to out and out warfare. This photo is from, "Mexico: A Photographic History," 2006, which I bought in Valencia, Spain when we were visiting my son Tomas, who was going to school there at the time. 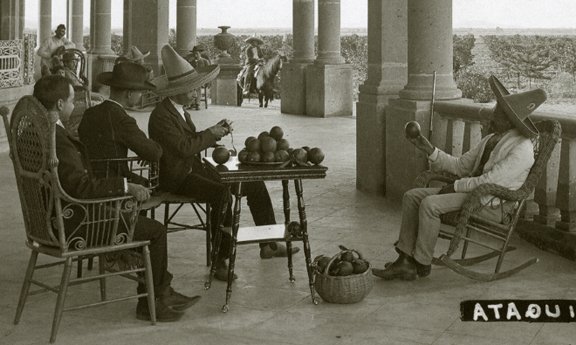 My friend Lauren Kormylo sent me a 1902 travelogue piece from Mexico about buying hats and, in the piece, it states, "There are few places of more interest in Mexico than a hat store. the prices range from 50 cents for a cheap straw to [$50] for a gold or silver encrusted felt. . .while we export to Mexico many things, we import from that country [$25,000] worth of hats every year. "Brims went out and crowns went up, and gold and silver, gallon, monograms, and what not, decorated these wondrous head coverings, until the Spanish hat en regal, represented a small fortune. . .Mexican's love and display of a big hat as elegant as his purse will allow, then, too, these big hats are delightful in a land of almost perpetual sunshine. 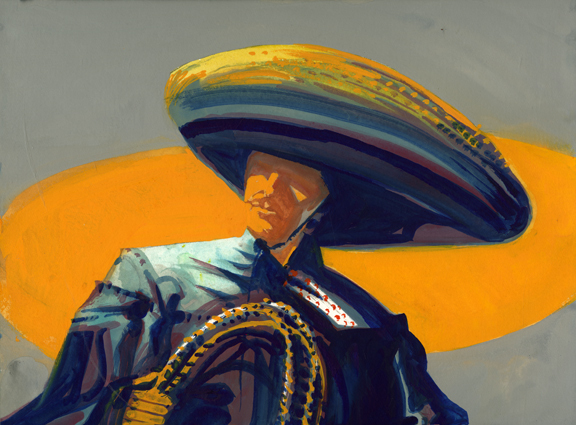 You laugh at the big sugarloaf hat on the border, but find yourself wearing it in the heart of Mexico." Now, one of my criticisms of the modern day hatmakers who are trying to emulate the sugarloaf (God bless them!!) is that the crowns are too symmetrical, and give off a submarine coning tower look—which results in derisive comments like the one my friend Doc Ingalls gets when he wears his: "What are you supposed to be, a conehead?" Not sure how the Mexican hatmakers achieved this, but it's a very sophisticated look. And by the way, I have been all over Sonora and Chihuahua looking for a shop that sells these sugarloafs and they are all extinct. "Funny how blessings brighten as they take their flight."